It is exquisite style and full automatic cutter. It can cuts printed sheets of name cards into cards size in one process, that is save cost, easy and shortcut to operate/use it. This cutter design legerity, boon, safe, request not too much power. 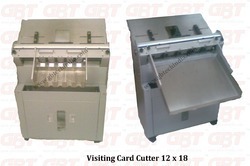 It is abroad apply in name-card/cards/eligibility cardsinvitation cards and so on, using this cutter, it can increase working speed. it has function of automatic and continune formfeed, it can cuts sealed name-card, the life-span of cutter is long, and have self-grind function, the edge of knife will keep tartness. Cutted cards without careless side, it is velvet. It take on the function of multi-direction, and discharge the flotsam between cards, the effect of cutting is better.It adopts the frame of pushing cardboard, that sure apeak of cut into cards. 1. the best novel streamline design, sutra occident style. 3.cuts A4 size name-card for twice, it can work in with the craftword of laser print name-card and making colour spew name-cards. 7.the capability is stable,and good price. 8.it is the preferred cutter for user. It has an exquisite look and is a fully automatic cutter. 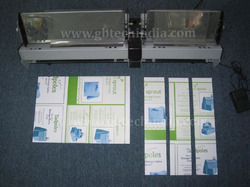 It can cut printed sheets of name cards into cards in one process. It saves cost and is easy to operate/use. The cutter design is sleek. It is safe to use and does not require too much power. 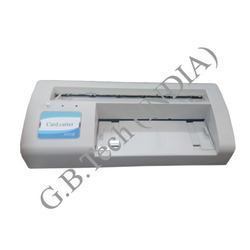 It can be used for cutting name-card/cards/eligibility cards\invitation cards and so on. Using this cutter, user can increase working speed. It can perform the function of automatic and continune form feed. It can cut sealed name-card, and the life-span of cutter is long. The performance of cutter is better as it takes on the function of multi-direction, and discharges the flotsam between cards. 3. Cuts a4 size name-card for twice. 4. It's performance can compare in beauty with other cutters of foreign origin. 5. It is stable,and is available at affordable price. 8. 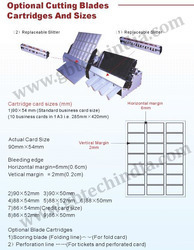 This isiting card cutter is the preferred choice of user.